Key market players in the nano-magnetic devices market are Intel Corporation, LG Electronics Inc., and Samsung Electronics. The rise in demand of nano-magnetic device is fuelled by the increase in demand of nanotechnology. There is a never ending demand of nanotechnology because of the requirement of size reduction and compact performance of electronics. Increase in demand of effective and energy efficient devices is driving this market reports Transparency Market Research. According to a research report, the world nano magnetic devices market is estimated to reach US$12.41 bn by 2024. The CAGR is expected to expand at 6.98% during the forecast period. The need for nano-magnetic devices has already become an essential requirement in several manufacturing process. The need for nano-magnetic devices in developed nations is offering a promising growth to the global market. The use of nanotech in cutting-edge manufacturing has become one of the important agenda for emerging economies like India and China, said a TMR analysts. The world nano-magnetic devices market is fuelled by the mounting demand for microelectronics in manufacturing of solar cells, flat panel displays, and microchips. Progress of nonmagnetic for wireless charging is gaining a lot traction in the market. Wireless power transfer requires magnetic materials of high materials for activating complex functions like inductive coupling and electromagnetic interference shielding. Inductive coupling is renowned technique in wireless power system. 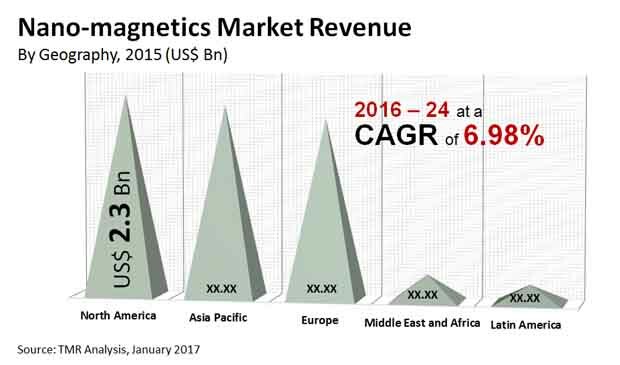 Rise in demand for the usage of nano-magnetic devices in medical, genetics, and sensor segments is predicted to increase during the forecast period. The growth is also carried by the need of nano-technology enabled sensors used in biological, physical and chemical sensing. These sensors allow specific recognition, sensitivity, multiplexing capability for a various kind’s safety, environmental, and health assessment. Factors such as characteristics and reducing scales of devices while equally gaining an escalation works in the favor of the growth of the world nano-magnetic devices market. It has become very much possible to develop devices that are extreme small as well as sophisticated than their antecedents. Nano technology are the building blocks of future devices that are smarter, power efficient, highly durable, and lighter. Commercial electronics also falls under the same category. The global nano-magnetic market can be classified into Product type, end-user industry, and geography regions. The steep cost of researching and development is causing a deterring impact on the world non-magnetic devices market. This restrain is not only limited to the market but also to a lot of other nanotechnology fields. The high cost of raw material accompanied with steep cost in research and development is creating difficulties in several countries, particularly the developing ones. The cost of nano-materials is high too due requirement of high volumes of energy and effort they require during their production. The lack of maneuver labor in this sector to handle the complex procedure is creating an obstruction in the growth of the market. According to the analyst, the key organization can maximize their focus on non IT application like that of homes, wearable, appliances, and automobiles as these application areas require low energy required devices accompanied by in-expensive raw materials. This is expected to deliver a commercial success and will act as a boosting factor for organization to make funds for advanced research and development. Countries like Japan, China, UK, and Canada are siphoning heavy funds into nanotechnology and nanorobotics. The increase in fund for research directly impacts on the growth of the market.